The analysis of the availability of lower sulphur fuels is underway at the International Maritime Organization (IMO) with every expectation that the results will be reported to its Marine Environment Protection Committee (MEPC) in October next year. Most in-depth analysis to date have declared there will not be sufficient refinery capacity to introduce the 0.50% global sulphur cap in 2020 and, in accordance with Annex VI of MARPOL, it should be delayed until 2025, but we’ll have to await the IMO’s study and MEPC’s decision. The current timetable may result in an earlier than expected decision providing refiners with some three years to change refinery configurations and make some investments to facilitate the production of 0.50% sulphur fuels. The lower than expected growth in the demand for distillates inland will also make the introduction of the global cap in 2020 more likely. The lower oil prices have resulted in lower sulphur differentials slightly reducing the attractiveness of scrubbing and possibly LNG as alternatives to 0.50 % marine fuels. However, the shipping industry is now more perturbed about compliance than the timing of the global cap. So should all environmentalists, since much of the good work done to clean up the air above the waves could be thwarted. Ship owners fear that without effective enforcement, they will not compete on a level playing field while meeting Annex VI regulations because of widespread noncompliance. The attractiveness of not complying - particularly if many states do not provide enforcement with adequate penalties - will be immense. If, as many people believe, open registries do not pursue transgressors operating in international waters, and port state control authorities do not have the powers or inclination to enforce Annex VI on the high seas, compliance could well break down since noncompliance will reduce total operating costs by more than 25% on most international voyages. The US Coast Guard has publicly stated that it will not pursue foreign flag noncompliance outside their 200 nautical mile Emission Control Area (ECA). This may well set a precedent for other nations. In fact, the less scrupulous registries will become more attractive to many owners. The uncertainty over the power of enforcement by port states relates to whether they have authority over the actions of a foreign flag ship when it is operating in international waters. An elegant approach might be to make it a breach of Annex VI to have product in a bunker tank with sulphur content above 0.50% unless the ship can demonstrate that it can operate compliantly with the higher sulphur fuel. Regulation 14 (8) - The sulphur content of any fuel in the ship’s bunker tanks at any time shall not exceed 0.50% m/m after [2020/2025] unless the ship has such fitting, material, appliance or apparatus or other procedures, alternative fuel oils, or compliance methods that are at least as effective in terms of emissions reductions as that required by this Annex, including any of the standards set forth in regulations 13 and 14. The offense would then be committed within the undisputed jurisdiction of the port state which is a signatory to the amended Annex VI. 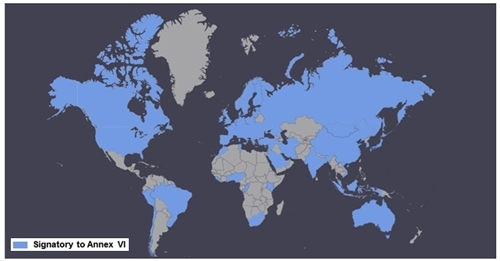 Some 90% of trade is through the ports of the current 88 parties to Annex VI (see map), and much of the trade through the ports of the non-signatory countries is with signatories to Annex VI which would enhance enforcement. Most countries that are signatories to Annex VI have reasonable enforcement systems. Pressure to exercise these systems may well be encouraged by the ship owning community. Inspection is relatively simple – check the oil log book with infrequent tank sampling. The penalties for falsifying a log book are already high and dissuasive. Like all regulations there are many ways to circumvent them, but this proposal to give port state authorities undisputed powers of enforcement will add some hope that we can improve the environment while permitting professional ship owners to operate on a level playing field.